The site has been renamed and moved to RPG Maker Times Companion. Please note that this new site is under construction, but development on the site is consistent. Be sure to update your bookmarks accordingly, as this site will no longer be used for RPG Maker. Eventually, it will be used for something else entirely. RPG Maker Times Companion is much more up-to-date Wordpress-ised site with the latest RPG Maker tutorials, scripts, tools and utilities, and news. 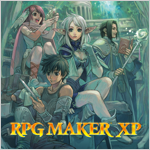 View more RPG Maker products and packages.